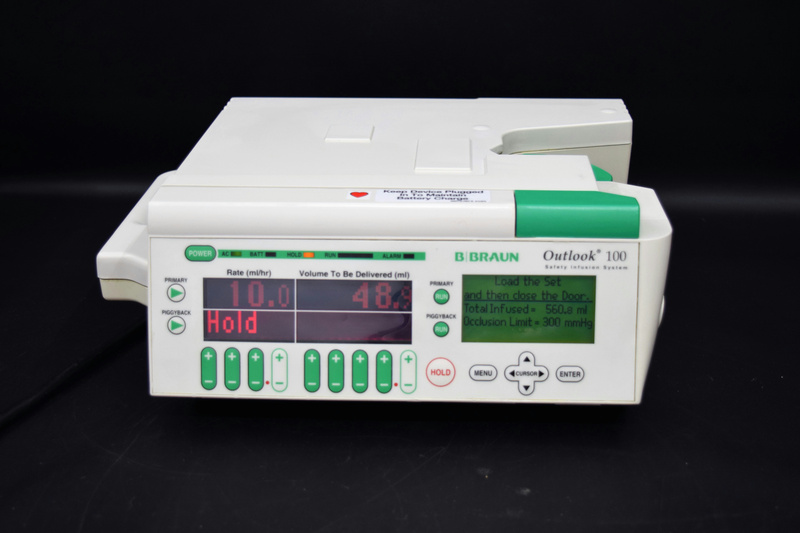 B Braun Outlook 100 Digital Safety Infusion System IV Pump 620-100 . New Life Scientific, Inc. These are used pump and all have individual cosmetic wear that is minor and will not affect the functionality of the instrument; these infusion pumps are in good working condition. New Life Scientific technicians have verified that the pumps power on, the battery charges, and holds the charge. The buttons were tested for functionality, sticking, and responsiveness. There are a total of sixteen infusion pumps available with individual details below for your reference. Please note the pump photographed is a conditional representative for the quantity available and you may not receive the specific pump in the gallery. Please visit here for the manufacture's manual. If you would like an individual photo of the one you are purchasing please send us the I.D.# and we will send you the photos. What is displayed in the pictures is what you will receive unless otherwise specified. In addition, if possible we are willing to perform whatever tests or examinations you may request in order to better determine the condition of the unit. Simply contact us with detailed instructions.